Not open to the public. 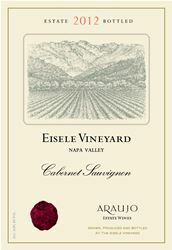 Since 1971, some of California’s most ageworthy Cabernet Sauvignons have been made from grapes grown at the Eisele Vineyard, located on benchland near the northern end of the Napa Valley, just east of Calistoga. Protected by the Palisades Mountains to the north and cooled by westerly breezes from the Chalk Hill Gap, this 38 acre vineyard is planted on warm cobbly soils that produce a low yielding crop of exceptionally concentrated fruit. Committed to producing estate grown wines of the highest caliber and distinction, the Estate employs organic and biodynamic farming protocols in the vineyard. The Cabernet Sauvignon, Sauvignon Blanc and Syrah wines produced in this remarkable place have a rare combination of forthright character, deep concentration without any sense of heaviness, and the capacity to develop profound complexity with age. The Napa Green program is supported by a wide variety of groups including the Sierra Club, the Audubon Society, and the University of California. The Napa Valley Vintners, along with Fish Friendly Farming, the Napa Valley Grapegrowers, the Napa County Farm Bureau and others developed the Napa Green program. Learn more about the program at napagreen.org. Eisele Vineyard is certified under the Napa Green Winery Program by the Napa County Department of Environmental Management (DEM) and the Association of Bay Area Government’s (ABAG) Green Business Program and completed all the regulatory components needed for environmental sustainability. These components included developing water and energy conservation methods, preventing pollution, and reducing solid waste. In addition to developing sustainable winery practices, this program is set to become the standard for the state of California. Eisele Vineyard is certified under the Napa Green Certified Land Program. Eisele Vineyard has created and implemented a customized farm plan with measured results that addressed all aspects of its property, vineyard land as well as non-farmed land, including practicing soil conservation, water conservation, stable drainage, riparian corridor enhancement, fisheries and wildlife habitat enhancement and long-term improvement and sustainability. Certification - certification is granted by the Napa County Agricultural Commissioners Office of Pesticide Regulation, the Regional Water Quality Control board, the California Department of Fish and Game, and the National Marine Fisheries Service. Receive updates about Napa Valley wine and events.